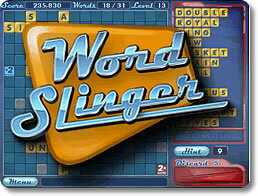 Word Slinger Game Review - Download and Play Free Version! An amazingly fun blend of Crossword and Scrabble word making! Scrabble/Crossword take on word games. 2 modes: Timed and Untimed offer two different styles of play. Power-ups can give you helpful hints, score boosts, and extra words. You do not get to create your own words. Success can be based more on chance than skill (you aren't in control of the words you are given). Imagine a game like Scrabble but with the words already formed and ready to go on the game board - that's Word Slinger. The trick is to link words together on the board in the best way possible. Different bonus spaces will appear on the board, challenging you to make the best use of space and letters. Form new words by overlapping your letters and get an even higher score (think Scrabble when you make more than 1 word on a single play). Each game level requires you to place a certain number of words before you can move on to the next level. In Timed mode, you only have so long to do this. In Strategy Mode, you have as long as you like. Word Slinger is a good game for people who like the basic Scrabble idea but may not want to spend the time to actually create words. If this sounds like you, give it a shot! 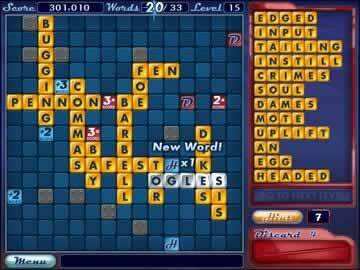 Word Slinger is a Scrabble/crossword-like word game that has you placing words on a game board. In this game the words you add must be incorporated in each other (like in Scrabble or a crossword). There are two modes of play available for both the pressure seeking players as well as for those more relaxed and casual. This game can be challenging so make sure you take full advantage of the power-ups, hints, discards, and extra words at your disposal. The general object of this game is to incorporate multiple words, up or down, in a crossword fashion. Unlike Scrabble or other crossword games you do not create the words you play. Instead the words are already created and are found in a column on the right hand side of the display. There are two modes in this game that create two differing styles of play. The first mode is a timed mode that adds a high pressure element. In this mode you start by placing a word on the game board. This word comes from the column of words on the right and is replaced by another word. Words add to the column on the right about every 20 seconds. Twelve words can fit in the column and once it exceeds twelve you lose the game. You must place the words on the board quickly in order to avoid the word stack piling up, causing you to lose. The second mode is untimed and is more focused on the number of words you can place on the game board. In this mode you have to place more words than you do in the timed mode, however, you are not under the pressure of the clock. Like in the timed mode, after you have placed a certain number of words on the board, you advance to the next level and earn more points. Discards, hints, and power-ups are resources you have in this game that can help you come up with new words and boost your score. A new hint is earned each level you complete and is a helpful clue that gives you an available word to play. The hints are especially helpful because they show how to place tough words for the maximum number of points. Discards are also an interesting facet of the game. Discards are used to get rid of a word or words you do not want to use or aren't helpful. You start each game with three discards. Hints and discards can be earned throughout the game through earning “power-ups.” These are pieces on the game board that give you added bonuses. These can be hints or discards (mentioned above) or additional words and add-ons to your score. The power-ups are important and it is a good strategy to play toward them. This game is fun, but has one major downfall. You do not create words. It's a word game that has you place words, but you are not in control of what you are placing and you do not get to spell your own words. This takes away from the challenge and fun of the game. What's a word game without having to make word? This should be an option of the game or the major facet. Not being able to write your own words takes away from the strategy and is a noticeable downfall that affects the game's play. Other smaller flaws are the game's difficulty levels and not having a multiplayer option. The one difficulty may make this too hard for some players and too easy for others. Also, not having a multiplayer mode makes this game limiting. 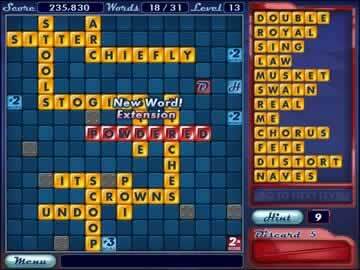 Word Slinger is a different take on word games that incorporates a crossword and Scrabble-like component. It is a fun game that has you placing words on a game board to earn power-ups, boost your score, and advance to the next level. Not being able to create your own words is a significant downfall of the game, but the two game modes create a different type of challenge. If you have an interest in Scrabble or crossword puzzles this game might be for you. However, understand that you are not going to be making your own words in this game.